Tucked away within the enchanting Amber Fort, 1135AD is an ornately decorated restaurant serving authentic Rajasthani cuisine. Silver furniture, glistening chandeliers and frescoed ceilings are the backdrop for delicious local dishes including Murgh ka Sula (tandoori chicken in a Rajasthani style), Lal Maas (a well-known, fiery red Rajasthani lamb dish), and Gatta (gram flour dumplings simmered in a spiced yogurt gravy). The Taj Rambagh Palace was the home of Jaipur royalty, until it opened its doors to guests in 1957. The Rambagh is affectionately regarded as the Jewel of Jaipur, and its fine-dining restaurant, the Suvarna Mahal, was formerly the maharaja’s royal banquet hall. Think gold plated silverware, rich tapestries on the walls and grand Italian Renaissance style décor. Alongside local Jaipuri and Mewari dishes, the Suvarna Mahal also offers a taste of Hyderabad, Kashmir and Patiala. The trendy Bar Palladio, located in the Narain Niwas heritage hotel, offers a taste of Italy in the Pink City. 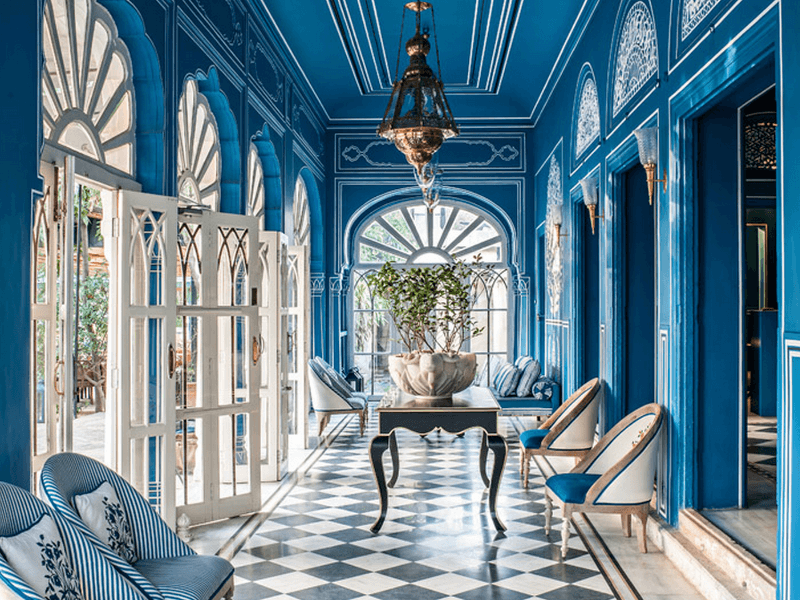 The chic and dream-like setting was designed by Dutch designer Marie-Anne Oudejeans, and inspired by the opulence of Rajasthan’s princely past. The kitchen here is founded on the premise that dining should be effortless, beautiful, simple and delicious. Dishes on the menu include minestrone, penne all’arrabiata, spaghetti carbonara. Nestled in the narrow lanes of Jaipur, Samode Haveli is a beautifully restored 19th century haveli (mansion) and now a popular hotel. 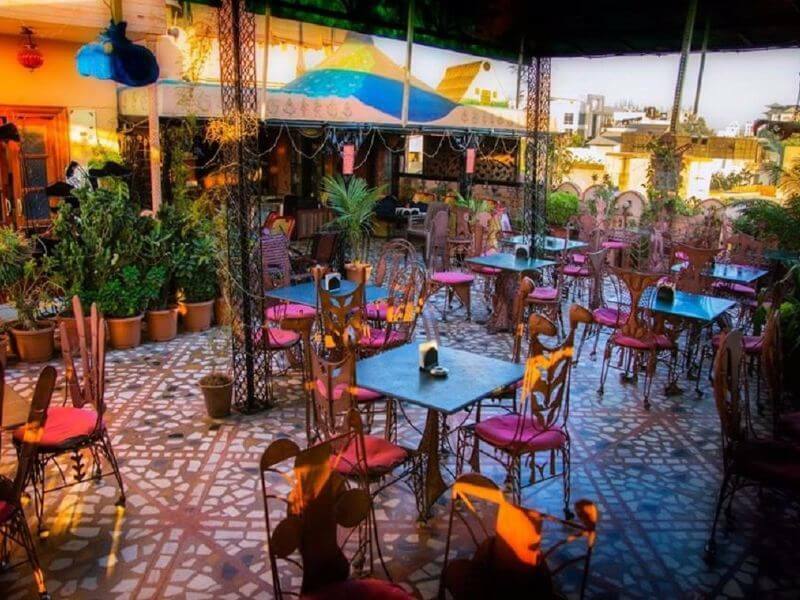 Their splendid restaurant is decorated with colourful frescoes and sparkling mirrored mosaics. The menu is passionate about traditional local recipes but also offers international flavours. We recommend the thali – a platter of lots of small dishes (a bit like Indian tapas! ), it’s a great way to sample many different tastes of Rajasthan. The Peacock Rooftop Restaurant is located on top of Hotel Pearl Palace (the real life Second Best Exotic Marigold Hotel!). The food is highly praised for being excellent yet inexpensive, and the ambience relaxed and fun. The restaurant serves a range of cuisines, though its speciality is most definitely Indian – particularly their tandoor dishes. 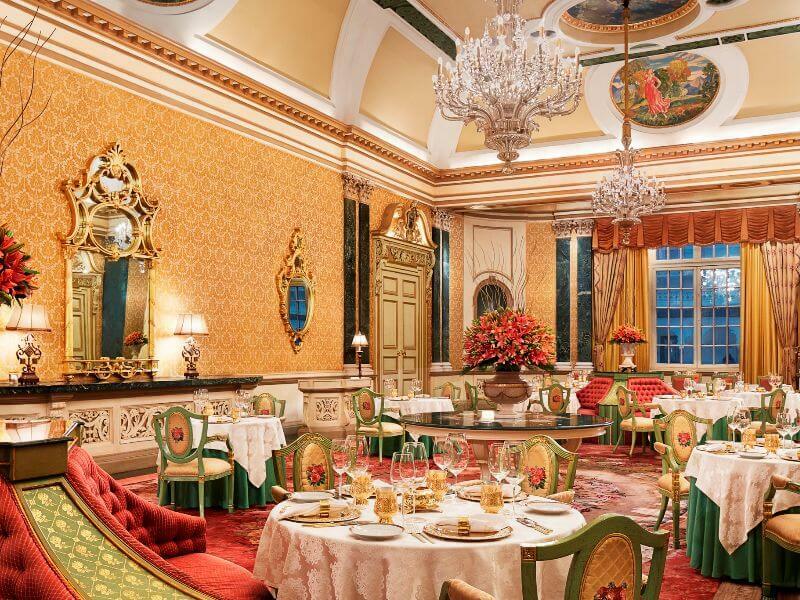 The Oberoi Rajvilas is a picture-perfect, opulent and magnificent 5 star hotel in Jaipur. The manicured lawns, shimmering pools and Mughal-inspired domes evoke the romance and grandeur of Rajasthan. The outdoor Raj Mahal restaurant specialises in authentic Indian dishes and has a tandoor bar, where guests can participate in making Indian breads and kebabs. 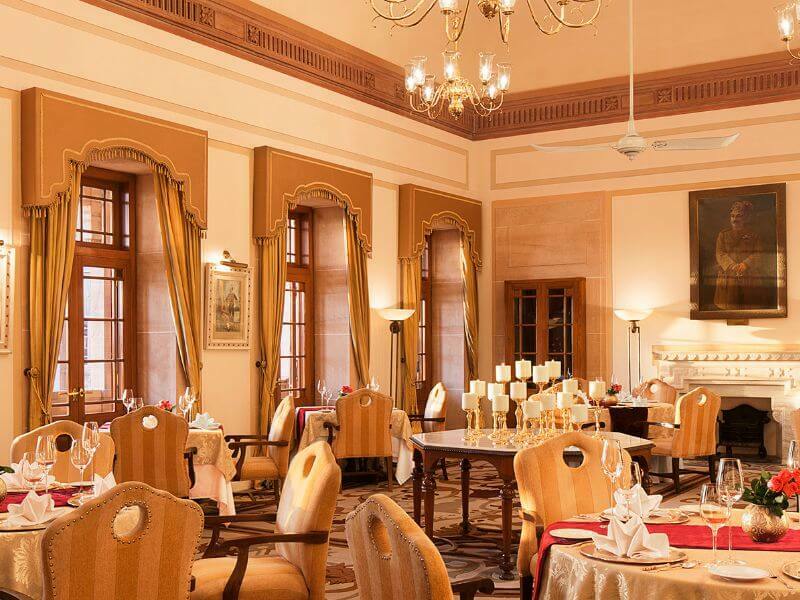 Beforehand, the Rajwada Library Bar provides a romantic setting to enjoy cocktails and fine wines. 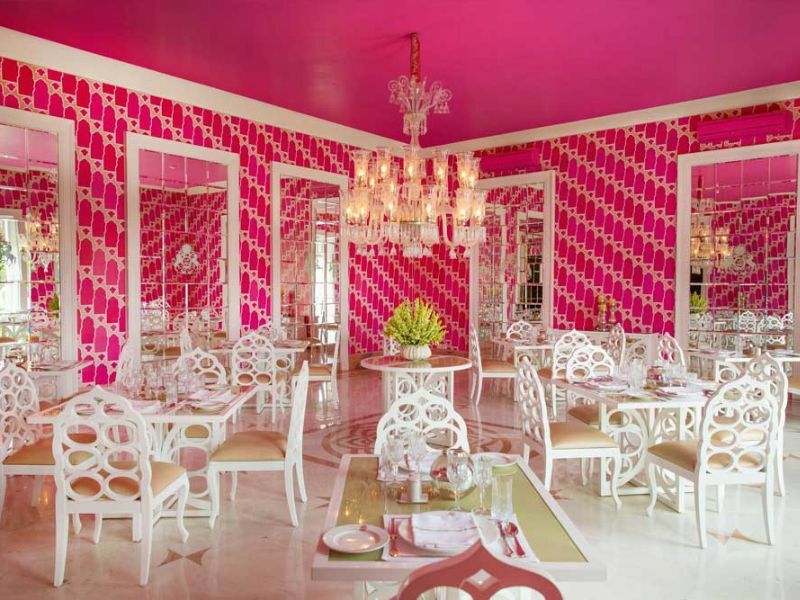 This vibrant dining room, in the heart of the Pink City, bears the cheeky name 51 Shades of Pink. 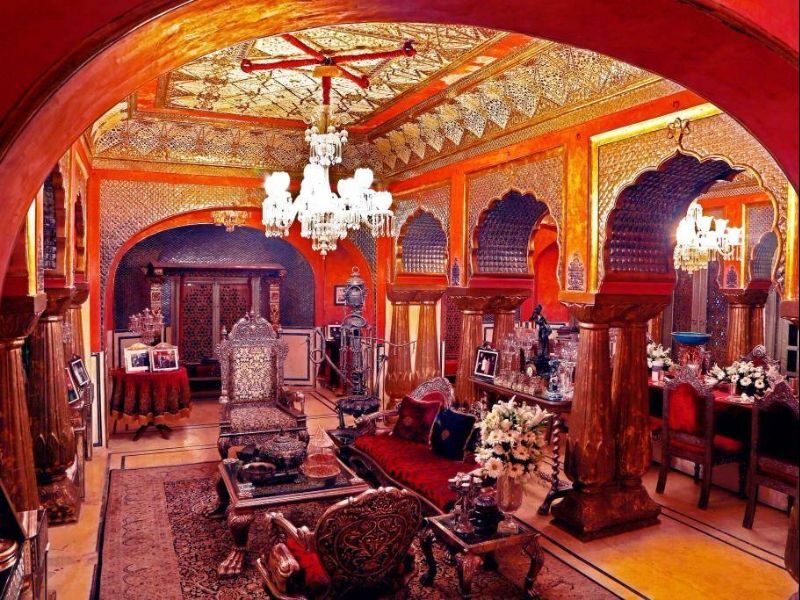 Adil Ahmad, a well-known Indian designer, was commissioned by Princess Diya Kumari to enliven the dining space. He drew inspiration from Jaipur’s nickname, the Pink City, and designed a hot pink wallpaper that plays with familiar Mughal shapes. Grand chandeliers, huge mirrors and Arabesque-style dining chairs add to the glamour. The restaurant offers a creative menu of continental dishes, but its charm lies in the setting. Perched on the rooftop of Pal Haveli hotel, Indique is in the heart of Jodhpur’s Old City and offers a spectacular panoramic view, taking in the nearby lake, the clock tower, the Umaid Bhawan Palace and – the star of the show – the majestic Mehrangarh Fort. We recommend their thali for a truly Rajasthani experience, though the menu also offers continental and Chinese dishes. If you’re not too firm on your feet, note that the steps leading up to the restaurant are very narrow and steep. 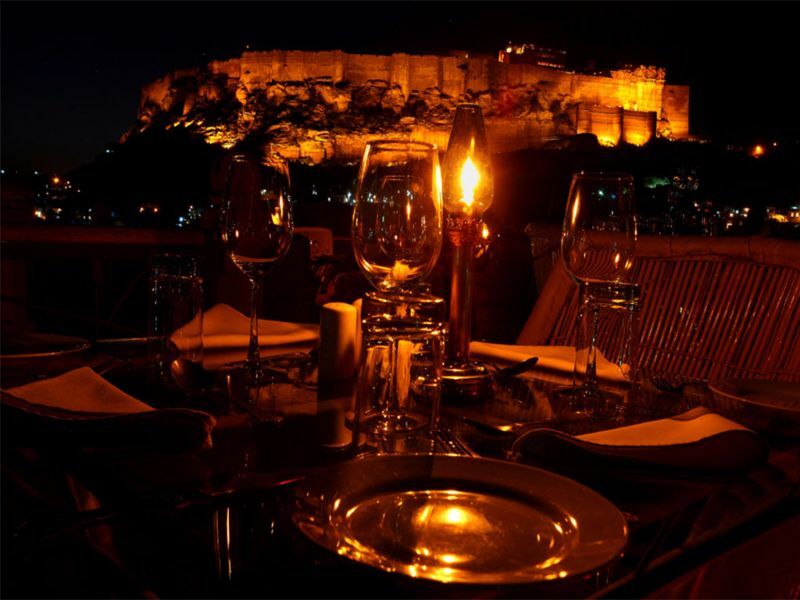 Located in Raas – a luxury 5* hotel in Jodhpur with a splendid view of the fort – this open air restaurant is especially romantic. Darikhana‘s menu offers a range of Indian and international food, including pasts, Mediterranean and Thai. Popular Indian dishes including the traditional Rajasthani Lal Maas (a spicy lamb curry), dahi kebab and chicken curry. The wild mushroom risotto is delicious, too. Risala is one of two restaurants at the Taj Umaid Bhawan Palace, a luxury hotel in Jodhpur which is the world’s largest private residency and still home to the Maharaja himself (albeit in a private wing!). 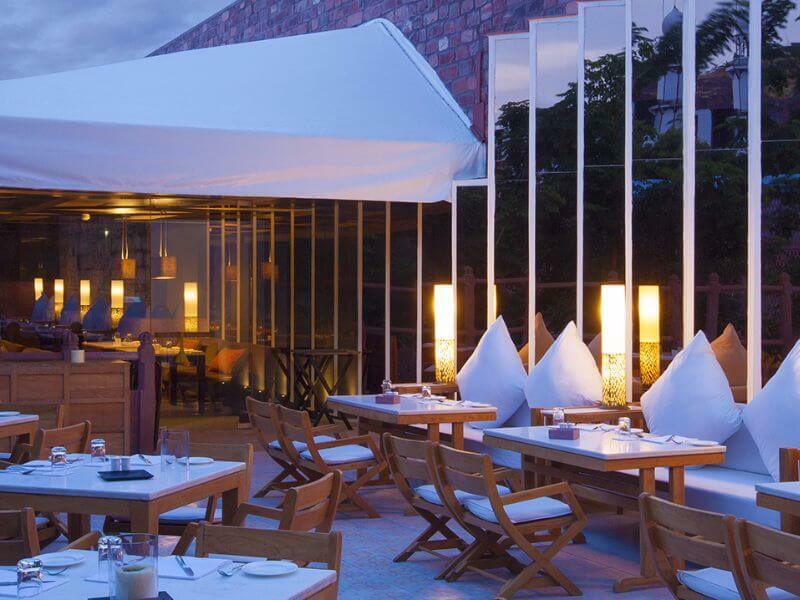 Risala translates to cavalry, and the restaurant celebrates the famous Jodhpur Lancers. This is a relaxed fine-dining experience with both Indian and international dishes. It’s worth noting that if you’re not staying at the palace, a cover charge is applicable for dining at Risala. Sunset Terrace is the perfect place to watch the sun set over Lake Pichola. The food isn’t particularly remarkable, but it’s the spectacular view we recommend coming for. Once the sun’s gone down, the ambiance gets even more romantic as candles twinkle and the Lake Palace floats on the shimmering waters. 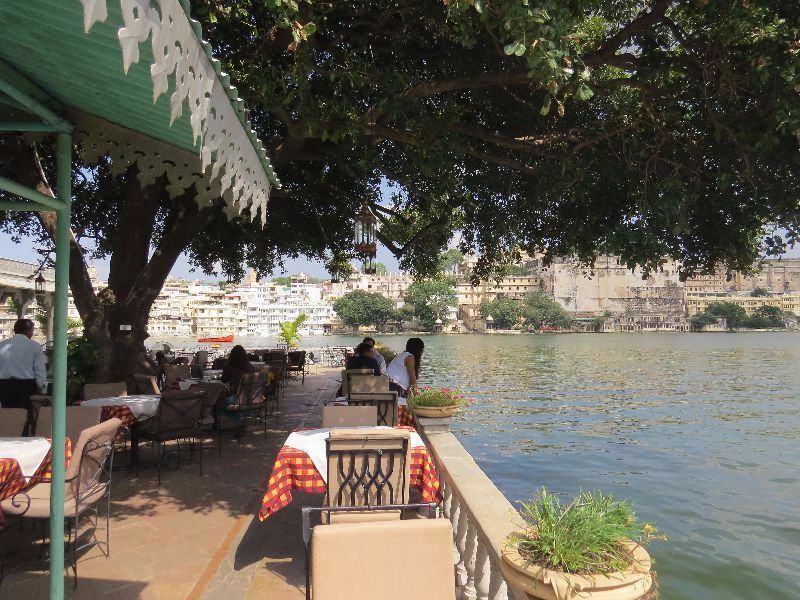 A favourite of our past guests, Ambrahi is one of Udaipur’s most popular places to eat. It’s right on the edge of the lake and offers splendid views of the City Palace to one side, and the Lake Palace on the other. It has a casual atmosphere during the day, as the white-linen tables are shaded by huge trees: at night, flickering candles and the floodlit City Palace make for an incredibly romantic experience. The service and cuisine is just as good, particularly the tandoori items. 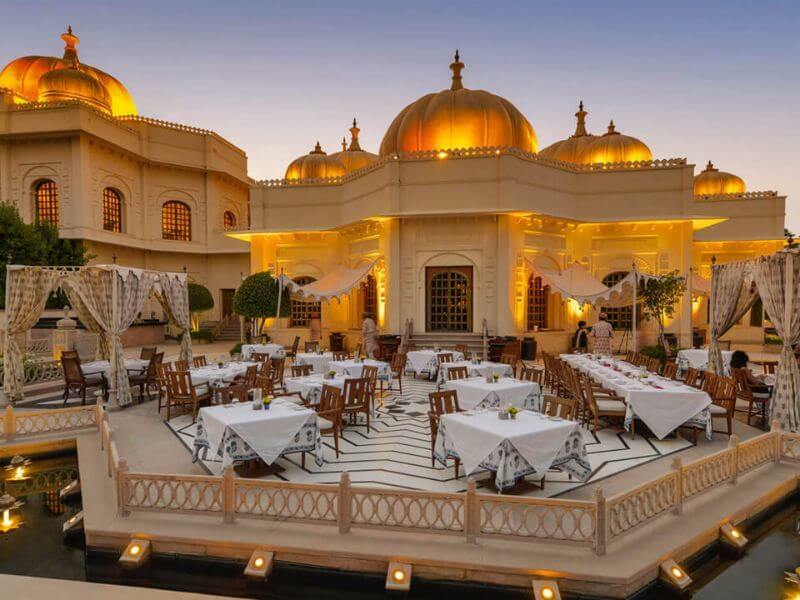 Named after the year Udaipur was founded, 1559 AD is located within an elegant colonial bungalow and spreads out into the large garden with alfresco tables. The menu offers Indian, Thai and Continental dishes, accompanied by live classical Indian music playing softly in the background. 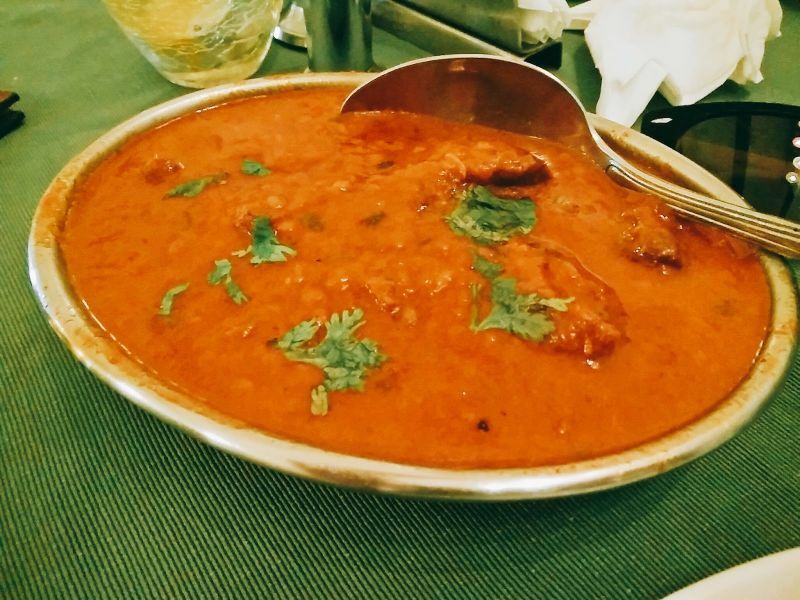 A speciality from the vegetarian menu is malai kofta (dumplings in a creamy, lightly spiced gravy). For the carnivores, salmon, rack of lamb and baby back ribs are all on offer. 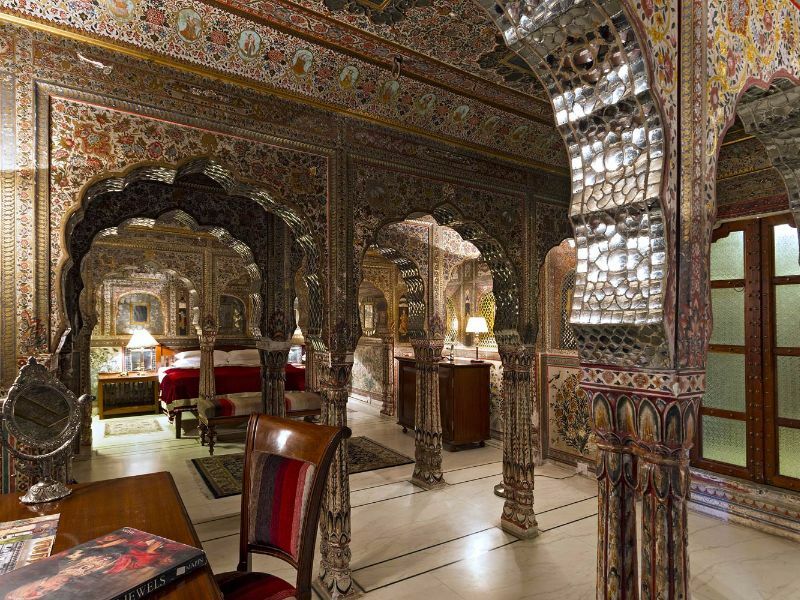 Whilst in Udaipur, do make sure you indulge in a fine-dining experience at the Sheesh Mahal restaurant. 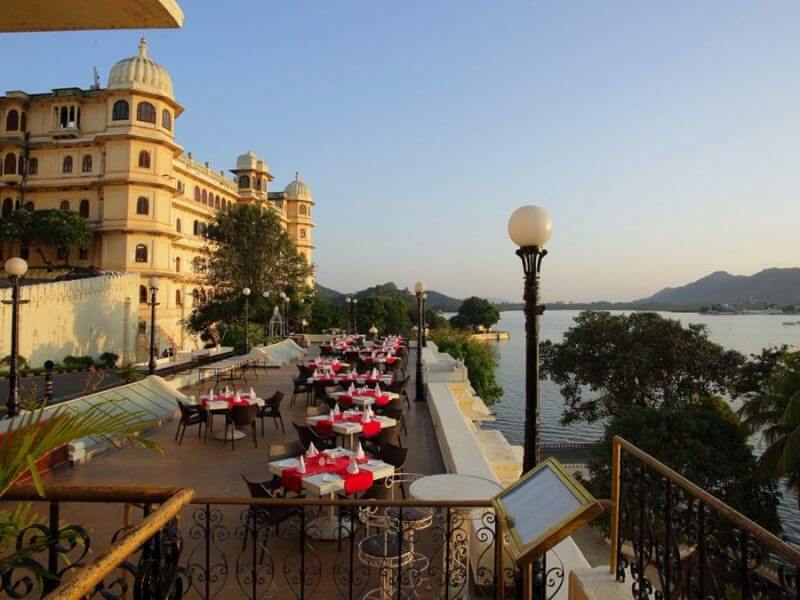 It may well be the most romantic restaurant in Udaipur, and certainly offers one of the most spectacular views. 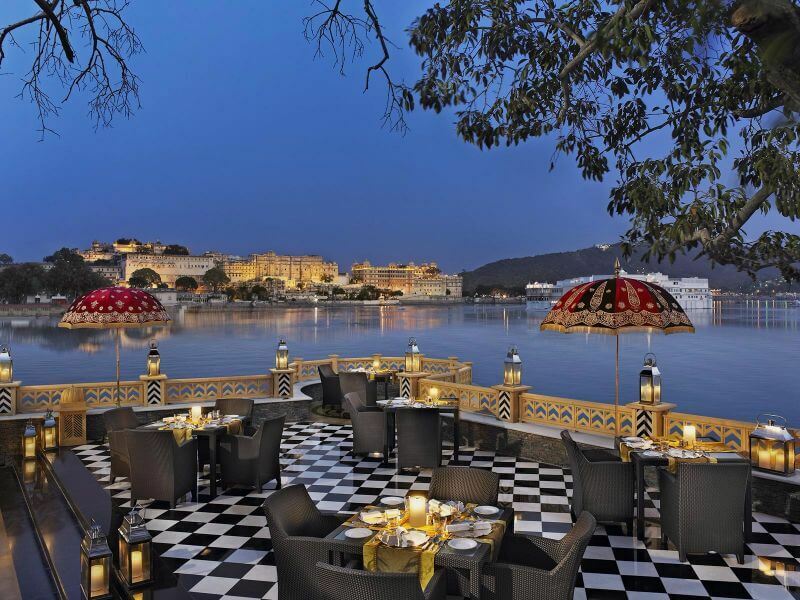 This alfresco dining space is nestled on the edge of the water, and affords a stunning panorama of Lake Pichola, the Lake Palace and the City Palace. The chequered floors, glowing lanterns and fragrant flowers add to the romantic ambience. The cuisine is equally captivating and some of the finest in Rajasthan. The Oberoi Udaivilas, a luxury hotel on the edge of Lake Pichola, was voted as the Best Hotel in the World by readers of Travel+Leisure magazine in 2015. With that in mind, you’d expect the food to be exceptional – and it is. At the traditional Indian restaurant, Udaimahal, guests can dine on rare regional cuisine and reinvented local classics. A huge domed ceiling depicting the night sky gives an alfresco feel, whilst musicians play softly in the background. This opulent restaurant offers an indulgent dining experience in a truly magical and memorable setting. If you’d like to soak up delicious culinary experiences on your upcoming visit to Rajasthan, please do get in touch. As specialists in private, bespoke tours of this region, we’d be an ideal match to assist with your arrangements and would be delighted to craft your tailor-made tour. If you’re wondering where to start, our Highlights of Rajasthan sample itinerary takes in Jaipur, Jodhpur and Udaipur, and is an ideal introduction to India’s most flavourful state. If you’d like to try your hand at preparing authentic local dishes, we also arrange private cooking classes.